The Childers Group put together an analysis of the past 12 years of arts grants in the ACT and the trends within different funding types. 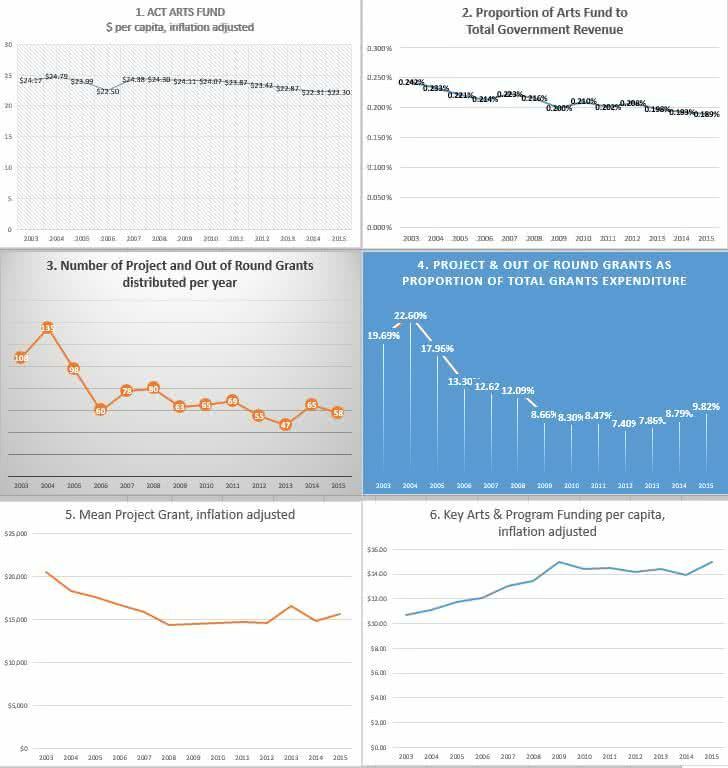 This analysis shows that over this time, stretching over three full electoral cycles, there has been a significant decline in ACT arts grants on a per capita basis, and as a proportion of funds available to Government. This analysis is drawn from over 1,500 grant entries in ACT Government annual reports, copied and sorted by grant type. The graphs are available here, the full analysis and notes are available for download in excel format here – we invite any corrections or further contributions, comments, or contact us on childersgroup@gmail.com or through Facebook. We think this information provides a clear picture of how arts grants to individuals and organisations are being prioritised in the ACT. When we consider the amount of services available to the community, and opportunities available to the arts sector, we see that we are trying to do more with less. On Friday 17 June, Childers Group members Jack Lloyd and Michael White appeared in front of the ACT Legislative Assembly Select Committee on Estimates 2016-17 to deliver this analysis. We have requested an immediate increase of $500,000 in new funding to the project grant round to arrest the significant decline in this area, and we urge the ACT Government and all parties seeking representation in the Assembly in the 2016 Election to commit to a restoration of arts grant funds to previous effective levels. You can watch our appearance here.